Izannah Walker Chronicles: Thank You and Congratulations to Mandy Broome! Thank You and Congratulations to Mandy Broome! A big thank you to Mandy Broome for searching and finding the link to the pictures I asked for. That was fast work! If you go to this site below you can see an Izannah that's seen a lot of love - scroll down to see how the bottom legs are somewhat separate from the upper legs. My theory is that the lower legs were stuffed and part of the 2nd skin which slipcovered the torso. Wow Dix and Congrats Miss Mandy!!!!!! Yay!Dixie,I am so glad that I could find this picture for you!I know you have been looking for it for a long time now.I still can't believe I found the one you wanted!I LOVE this blog,by the way,and it is so kind of you to give of your time like this,to enrich the knowledge of all we Izannah Walker fans.I can't tell you how nice it is to be able to come to one place and find such a wealth of wonderful information! Please email me if you have information, pictures, sources, etc. about original Izannah Walker dolls. 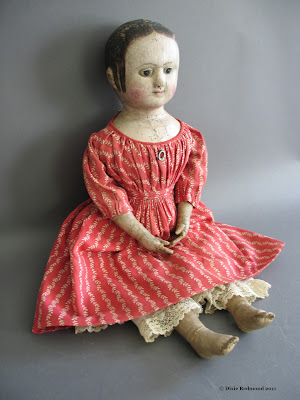 The goal of this site is to be a free clearinghouse of information for Izannah doll lovers. Copyright of pictures published on this site are retained by the collector, museum, or artist etc, who took the picture. This site began on January 1, 2008 as a way to share pictures of original Izannah Walker dolls with those who love them. It's come a long way! Thank you to all of you who have come here to read and research. 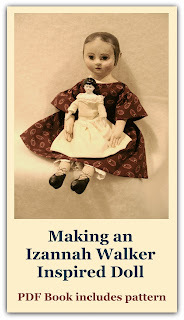 The following have shared images of Izannah Walker dolls or articles about Izannah Walker dolls. Each name links to a post where their doll is featured. Please visit them. All photos/pictures presented on this site are copyrighted by those offering the images for posting and are not to be taken. All writings are copyright Dixie Redmond unless specified.